With the recent launch of a new iPad tablet from Apple and the holidays closing in, you might be thinking about buying a new tablet. 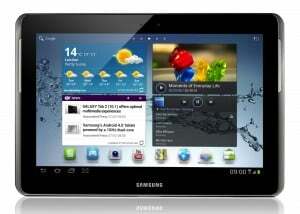 Perhaps the bigger tablet from Samsung, the Galaxy Tab 2 10.1 is of interest to you, especially if you know that it will come with 4G LTE data with Sprint, starting with November 11 at a price of $549.99. This will be the first time that Sprint offers a tablet featuring LTE data, and this poses big interest for them. The Galaxy Tab 2 10.1 has a 10.1 inch IPS LCD Display at 1280×800 pixels with a 1.5 GHz CPU and Android 4.0 ICS. It also packs 8 GB of internal memory, a 3 MP rear camera, and starting with November 11, 4G LTE with Sprint. If you are thinking about purchasing a Galaxy Tab 2 LTE, you should know that the monthly payment has a starting price of $14.99 offering 300 MB and ends up with the price of $79.99 for 12 GB of data. This will only be the price of LTE that you have to pay to Sprint.